You look for a good deal when you’re looking to buy something new, right? Sure you do. So why not do the same with your web hosting service? There are lots of great deals out there, including some pretty fantastic offers available right now from HostPapa. This first offer is for individuals or small businesses with basic needs. The original price for this shared hosting plan is $7.99/month. HostPapa typically offers a discounted price of $3.95/month, but they are offering an even lower price through Web Hosting Ratings: $3.36/month. That’s a saving of 58%. The starter plan gets you two websites, free domain registration, 100 GB of disk space, unlimited bandwidth, and more. It’s a great deal. If you want everything the starter plan offers plus unlimited disk space and a selection of advanced features designed for business owners, you can get the Business plan right now for just $3.36/month. Once again, this is the WebHostingRatings.ca price. You are saving 74% over the original price of $12.91/month. 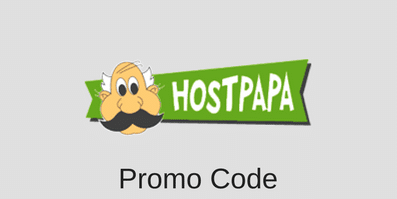 Receive a 74% discount and a free domain name with a new HostPapa's shared hosting plan by using this HostPapa coupon. Last but not least is the Business Pro offer. This plan gets you all the same features found in the Business plan plus a whole lot more. Business Pro offers a 300% performance boost and four times more CPU power. It gives you security enhancements including a premium wildcard SSL and automated backups. Customers normally pay $19.99/month, but you will save 45% with a Web Hosting Ratings price of just $11.01/month. So, are you ready to sign up with HostPapa?